"Sometimes you don't even know who you are talking to on the phone, it might just be one or two people that run a label. You really have to be up on your social networking." SKID ROW burst onto the metal scene in 1989 with their monster self-titled debut album, following it up a couple of years later with another platinum effort, Slave To The Grind, which established the band as a force to be reckoned with in the overloaded rock world. Following the departure of original vocalist Sebastian Bach in the mid-90's, the band's future seemed in doubt. Determined to soldier on, the band tapped Texas native Johnny Solinger to replace Bach and the band hasn't looked back since. In 2013, the band released the first in a planned EP trilogy, United World Rebellion - Chapter One and, most recently released Rise Of The Damnation Army - United World Rebellion: Chapter Two. 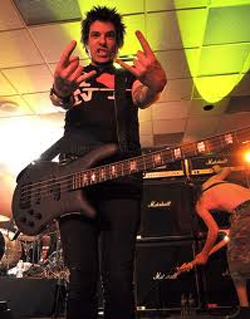 I recently had a chance to talk to their long time bass player Rachel Bolan about their new trilogy, the music industry, and his recording with STONE SOUR. Check it out! 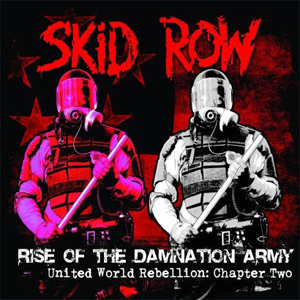 KNAC.COM: You have a new release coming out; Rise Of The Damnation Army, United World Rebellion: Chapter 2. In the publicity kit I was sent, I saw this was going to be an EP, not a full LP release, and that it was going to be a part of a series of EPs that SKID ROW is releasing. Nick made statements about about why you are doing this, but he didn't really go into much detail. So I would like to ask for more details concerning why you have decided to do EPs for these releases. BOLAN: The idea came up over a year ago. We decided to do a concept for three EPs in a trilogy. For one thing, today is the age of information overload. And there is so much coming out, and we wanted everything to be of real quality, from a consumer's standpoint. And writing ten songs, and picking our favourite five is a lot easier than writing 30 songs and picking our favourite ten. We are doing these 3 years in succession, and it keeps people aware of the band, it keeps us out on the road, and from an economical standpoint, it's easier for SKID ROW to tour when we have a new album out. It costs less to do an EP, so we can sell it for less, and it's just a really cool way of doing things. From a songwriter's standpoint, it takes a lot of pressure off, and we can really just focus on the songs at hand. With longer releases now, people like to pick and choose their songs anyway, so this has really worked out well for us. Are we going to keep doing it this way? I have no idea. But for right now, we are going to be doing it with this trilogy. KNAC.COM: Do you think that bands recording shorter-length EPs, like what you are doing with this, is going to become the standard? Or do you think this is something that bands are just experimenting with just because of the internet, downloading, and what you said about people picking and choosing their songs? BOLAN: You know......it's hard to say. I actually remember back in the day, when all you used to buy was EPs and imports, from metal bands and punk bands overseas. I remember one punk band that actually would only record one side and use the other for another band, and they would both do three songs. Maybe that is the way things are going, I don't know, but there are quite a few bands who are doing it like this. KNAC.COM: Have you thought about doing a split EP with another band? BOLAN: No. At this point, we are just focusing on the EPs. I don't know who would even want to split with us anyway [laughs]. KNAC.COM: What are some things, aside from everything you have mentioned, like the internet and downloading, that have changed in the music industry, not just in hard rock and heavy metal, but even just the music industry in general? BOLAN: The super big record deals aren't out there anymore. Things are just too instant. Sometimes you don't even know who you are talking to on the phone, it might just be one or two people that run a label. You really have to be up on your social networking. KNAC.COM: On the subject of social networking, do you find that it a useful tool to help you promote SKID ROW, or is it just one of these things where you go along with it just because it's what everyone does? BOLAN: Sometimes, it really gives a good shot with helping promote. But really, the jury is still out with me. That doesn't translate to show attendance. Sometimes I wonder what personal friends will think when they go on and see the rants on my personal page. People are just so ANGRY all of the time. Sometimes I am afraid to even open it up. Aside from that, I still don't know if it translates into sales. It definitely gets the word out, and people hear your stuff. KNAC.COM: Bands from the 80s and early 90s that play glam, hard rock, heavy metal, have made a resurgence and a comeback over the last few years. Have you found that this has affected your music sales or show attendance at all? Or has it not really made a difference for SKID ROW? BOLAN: There is definitely a resurgence, and we are lucky enough to be one of those bands that has a cool history. There are certainly people who are into it for the nostalgia. We are down for that, and we love playing the old stuff. But we still want to record new records and play new music. KNAC.COM: I am going to ask you about some things not related to SKID ROW. You recorded bass with STONE SOUR on House Of Golden Bones, 1 and 2. What is it like recording with a band like STONE SOUR that is not only newer, but not really your project, and how that differs from the recording process of SKID ROW? BOLAN: It was great. When I got the call from Corey, I was not only completely flattered that they thought of me, but it is also because I am a fan. It was a pretty daunting task because those guys are incredible musicians and I had to learn 23 songs in two weeks. The pressure of not having written the songs, and therefore not having a vision of what they wanted, was something else. With SKID ROW, I have a vision of where I want the songs to go. And when I went in, they said "just play your style" and I really didn't know what they wanted. But when I went in there, they made me feel comfortable which was good because the only guy I really knew was Corey. They were so cool. It was about five days, it was a lot of fun and laughs. Everyone was really chill. It was a really good time. KNAC.COM: Are there are any plans for you to record with them again in the future? BOLAN: It was a one time thing. They have Johnny in the band now. KNAC.COM: Back to the trilogy. When part 3 comes out next year, are you going to be doing another full-scale tour? Especially considering how big the schedule for this run was? BOLAN: I am sure we will. We love to play. We will probably hit up some markets we haven't hit up yet in 2015.